Philip Habib will evoke fond memories of Hudson's once-thriving commercial sector and the contribution of the Lebanese community to Canada when he inaugurates the 2011--12 monthly season of Hudson Historical Society meetings on Monday, September 12 . His presentation, Hudson's First Lebanese Family, will cover three generations of Habibs and will touch on Hudson's other prominent Lebanese family, the Shaars. HUDSON MUSEUM PRESENTS : HUDSON'S "GREATEST GENERATION"
Invitation YOU ARE INVITED TO VISIT: HUDSON’S “GREATEST GENERATION” An Exhibition at the Hudson Museum From Saturday May 21, 2011 Informative and educational, this multi-media exhibition focuses on the Second World War (1939-1945) and its impact on the residents of Hudson, Como, and Hudson Heights. Come to see the artefacts that defined the wartime era and that still evoke its unique ambiance. Stroll around the Victory Garden, watch the slide show, hear the stories of the veterans told in their own words, recorded for posterity on podcasts. Lest we forget. Grand Opening Day SATURDAY MAY 21st between 10 a.m. and 5 p.m. 541 Main Street, Hudson Admission is free The educational and informative exhibition will continue to be open on weekends throughout the summer. The new Hudson Museum and Tourist Information Centre opened its doors to coincide with the Hudson Street Fair on August 1 2009. By means of old photos, artifacts and video screenings. 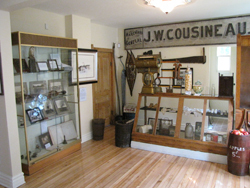 the Museum presents a lively overview of our Town's history. It will also function as a Tourist Information Centre where visitors will be able to find directions to our wonderful hiking trails, Sandy Beach, the Greenwood Centre for Living History and other interesting local attractions. 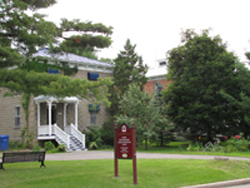 We hope in time to accumulate more artifacts and historical information about Hudson and the immediate surrounding communities of St Lazare, Vaudreuil-Dorion, Rigaud and Ste Marthe to make this small museum an integral addition to this amazing community. If you have any artifacts that you would be willing to donate or loan to the Museum for its display, please contact us via this link. Please note that we have not yet established our regular opening hours, so please refer back to this site for more information.